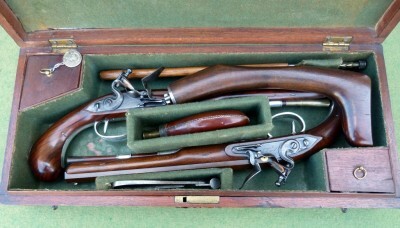 With 10 ½ inch swamped octagonal browned barrels with silver foresights signed along the top flats “Wogdon LONDON” engraved with a band of beadwork at the breech, gold lined touch holes, finely engraved case hardened tangs incorporating the rear sights, case hardened detented bevel edged locks each retained by two side nails with safety catch, roller frizzen, blued steel spring and stepped tail, highly figured walnut full stocks, engraved silver trigger guards with acorn finials, octagonal silver ramrod pipes, set triggers, original ramrods one with worm and brass powder measure, the butts each fitted for the shoulder stock with cavities covered by a silver plate engraved with owner’s crest; in their original fitted mahogany case lined with green baize the lid (minor damage) with Chippendale style handle, with accessories including a fine Wogdon leather flask with pull off top. London proof marks; London silver hall marks for 1785 and silver maker’s mark of Michael Barnett. Provenance: William Keith Neal Collection. Which awaits alike the bully and the brave. As any artifice your victims save.